This past year has seen democracy issues take center stage in the national debate. From voter registration modernization to campaign finance reform to fair redistricting practices and more, state policymakers across the country have capitalized on this momentum to enact policies that will improve and expand their state’s democracy and democratic institutions. Unfortunately, however, some leaders continue to advance an agenda that takes their state in the wrong direction. This is the state of play for democracy in 2015. Five big ideas are shaping the political landscape and providing opportunities for participation and representation. At the same time, five states are bucking the trend by continuing to limit citizens’ access to a healthy democracy. From removing barriers to political participation through public campaign financing to making voter registration more accessible and secure, these are 2015’s five major, bipartisan themes for reform to ensure that everyone has the opportunity to engage with and be fully represented by their elected officials and government institutions. A new automatic voter registration law, also known as the New Motor Voter Act, adds anyone interacting with a state’s motor vehicle department to the voter rolls—unless they opt out. This represents a critical step forward in ensuring that registering to vote is a secure, convenient process for would-be voters. 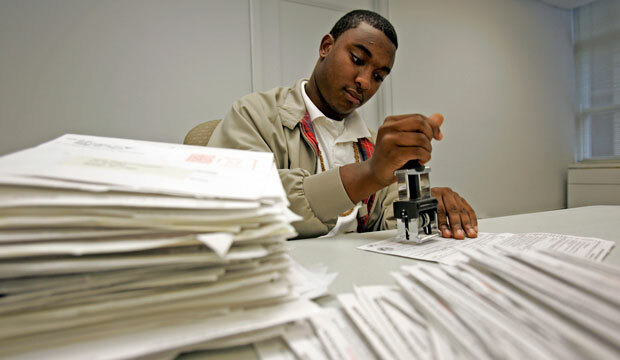 Additionally, expanding automatic registration could have an important effect on voter turnout: A May 2015 study by the Center for Popular Democracy found that the nationwide adoption of automatic voter registration would add as many as 55.8 million new voters to the rolls and could lead to as many as 36 million more votes being cast in future elections. In March 2015, Oregon became the first state to adopt automatic voter registration. Since then, the idea has rapidly gained momentum in a diverse array of states. Just months ago, California—recognizing that roughly 6.6 million eligible Californians were not registered to vote—also adopted the measure, while additional legislation and ballot measures are on the move in states across the country. Unfortunately, this measure has not seen success everywhere. In November, New Jersey Gov. Chris Christie (R) vetoed the Democracy Act, which included the adoption of automatic voter registration along with a package of reforms to modernize registration. Currently, approximately 1.6 million eligible residents of New Jersey are not registered to vote, and just 21 percent—a historically low number—of registered New Jersey voters went to the polls in the 2015 elections. Had Gov. Christie not taken his veto pen to the bill, 16 percent of U.S. voters would now live in states that provide access to automatic voter registration. Online voter registration is a critical voter registration modernization reform. It ensures that registration is accessible and convenient for a large swath of voters, particularly military and other overseas voters, and can increase voter turnout, particularly among youth voters. Registering to vote online reduces errors in the voting rolls, resulting in up to five times fewer errors, and can be a significant cost-savings opportunity for cash-strapped states. In Arizona, for example, each online registration saved $0.80 over traditional paper registrations. That is why, across the country, 2015 has seen a surge in states fully embracing online voter registration, often with bipartisan support. Florida, Iowa, New Mexico, Oklahoma, and Pennsylvania adopted new online voter registration procedures, while Nebraska and Vermont implemented previously passed legislation. Gerrymandering, or the process of manipulating district lines to favor a particular political outcome, undermines a healthy democracy. Such lopsided districts can not only determine electoral results but also create an echo chamber in which candidates and elected officials may feel responsible only to people of similar demography and ideology rather than to a broad base of voters. In 2015, both state and federal courts have played a major role in striking down flawed maps. Alabama, Florida, and Virginia all saw victories for anti-gerrymandering suits. Moreover, in Arizona State Legislature v. Arizona Independent Redistricting Commission, the U.S. Supreme Court ruled in favor of Arizona’s independent redistricting commission’s citizen-granted right to draw district maps—a decision which, had it struck down such independent commissions, could have affected as many as one-third of all congressional districts across the country. While not every court battle has been successful—a challenge to several state House and Senate districts in Virginia was denied in October—the courts have served as a critical backstop against many blatant attempts at gerrymandering. Yet as the U.S. Supreme Court takes up two critical redistricting cases in its current term, Shapiro v. McManus and Evenwel v. Abbott, several states are taking their own proactive approaches to creating better maps. For example, in Oregon, a law was passed and signed requiring a series of public hearings on legislative and congressional maps. In Pennsylvania, a bipartisan working group of legislators has come together to “tackle redistricting reform.” In Maryland, Gov. Larry Hogan’s (R) Redistricting Reform Commission has recommended an independent panel be tasked with drawing maps, and it is now up to the legislature to act. And in Ohio, voters in the 2015 election resoundingly passed Issue 1, creating a bipartisan redistricting commission and an explicit ban on partisan gerrymandering. So-called independent expenditure organizations—for example, Right to Rise USA, the super PAC dedicated to electing former Florida Gov. Jeb Bush (R) as president —are often not subject to the same contribution, expenditure, and reporting requirements as candidates, campaigns, and affiliated—or coordinated—groups. Yet from mutual mailboxes to creatively named committees, this election cycle has seen the rise of allegedly independent activity that tests the legal limits. While the Federal Election Commission’s rules on coordination remain “pretty toothless,” according to the Brennan Center for Justice’s Ian Vandewalker, several states have taken matters into their own hands in 2015, clarifying and strengthening state campaign coordination laws. In October, California’s Fair Political Practices Commission announced new coordination rules in which the burden of proof in coordination cases is moved to campaigns and independent organizations, which must now demonstrate that they are not illegally coordinating. In Montana, similar changes to strengthen campaign coordination rules went into effect in November as a component of rulemaking around the state’s Disclose Act passed earlier in 2015. As the coordination crisis continues to intensify, these moves stake out important ground on disclosure and transparency. Removing barriers to political participation for women, people of color, and young people is a critical measure of the health of a state’s democracy. For too long, the donor class has controlled political—and, therefore, policy—outcomes. Providing options for candidates who lack access to the networks of donors necessary to run and win a traditionally funded campaign is critical toward removing these barriers. In 2015, however, ballot measure victories on opposite coasts represent the triumph of democracy over big money. In Maine, voters passed an initiative to expand and modernize the state’s current public campaign financing system while reducing the impact of outside spenders through increased political disclosure requirements and tougher penalties for breaking the law. In Seattle, voters approved a system of campaign contribution vouchers, giving every voter four $25 vouchers that they can donate to any participating candidate, effectively “turning every single voter in the city into a donor.” In turn, participating candidates are required to meet strict contribution and spending limits. These two ballot measure victories represent the best of state democracies: functioning as a laboratory for solutions to the crisis of big money in politics and creating opportunities for a road map for states interested in advancing solutions to the outsized role of money in the political system. Despite promising developments across the country, not every state is moving in the right direction to create a healthy state democracy. From vetoing the restoration of ex-offender voting rights to opposing government accountability, the five states below—Maryland, Kansas, Pennsylvania, Alabama, and Wisconsin—represent the most blatant abuses of democracy in 2015. Rather than continuing down this path, these states should look to the examples above for bipartisan opportunities to support and expand policies that make government work for everyone, not just the wealthy and well-connected. Laws barring ex-offenders from voting can significantly disadvantage communities of color and have the potential to skew electoral outcomes. Due to felony disenfranchisement laws, more than 4 million Americans who have already served their sentence are currently denied the ability to exercise their fundamental right to vote. This is not only a civil rights issue but also an issue of electoral integrity: With fully 1 out of 13 African Americans currently unable to vote, felony disenfranchisement has the potential to affect electoral results because voices from communities of color are disproportionately silenced. Individuals and organizations that work to disenfranchise voters often do so in the name of preventing voter fraud. What they fail to admit, however, is that voter fraud is exceedingly rare. In fact, one investigation found just 31 credible cases of potential voter impersonation out of more than 1 billion ballots cast between 2000 and 2014. Nevertheless, what is essentially a voter fraud witch hunt by Kansas Secretary of State Kris Kobach has resulted in thousands of voters being prohibited from casting a ballot. Secretary Kobach gained national notoriety in 2013 for enacting a two-tiered voting system: one system for voters with the documents to prove U.S. citizenship and one for those without such documents. Unfortunately, many voters lack access to the birth certificate or passport needed to prove their citizenship. In 2013 alone, 17,000 otherwise eligible Kansans were blocked from registering to vote thanks to the new rules. This year, Kobach suspended more than 36,000 voter registrations for failing to provide citizenship documents. While a judge has denied the secretary of state’s request to end legal challenges to his two-tiered system, Kobach’s attempts to keep eligible individuals from exercising their right to vote are far from over. This year, Kansas Gov. Sam Brownback (R) made him the first and only secretary of state in the country with the authority to prosecute alleged voter fraud, a clear indication that Kansas voters can still not be sure that their vote will be cast and counted without Kobach’s interference. In 2015, however, the Pennsylvania Supreme Court races set a record: At least $15.8 million was spent in these races, much of it on negative television ads, making this the most expensive state judicial election in U.S. history. This extreme increase in the role of money in judicial elections may in part explain why not one of the seven candidates on the ballot in these Pennsylvania Supreme Court races was a person of color. An October report from the Center for American Progress found that increasing amounts of money in judicial elections—particularly partisan judicial elections, as in Pennsylvania—serve as a significant barrier to access for judges of color. Thus, this record-breaking campaign cash in the Pennsylvania Supreme Court elections has troubling implications for both the integrity of its courts and the overall health of the state’s democracy. Prior to the 2013 U.S. Supreme Court ruling in Shelby County v. Holder, which overturned Section 5 of the Voting Rights Act, states and localities with a track record of voter discrimination were required to receive preapproval from the U.S. Justice Department for all voting and election law changes. In the wake of Shelby, however, many previously covered states have rushed to disenfranchise voters, particularly voters already fighting for inclusion in other ways, such as young people, working families, and people of color. Alabama is no exception. In the Center for American Progress Action Fund’s 2015 report examining the health of state democracies, Alabama ranked last—51 out of 51—in the nation when including the District of Columbia. Rather than spurring an effort to strengthen and restore the state’s democracy, however, Alabama has continued to serve as a national model of what not to do. In October, the state announced that it would close 31 driver’s license agencies throughout the state, meaning that 28 counties would lack a place where citizens can obtain a driver’s license. Since government-issued photo IDs are required to vote in Alabama, this decision limited Alabamans’ access to the polls. Shockingly, 8 out of the 10 Alabama counties with the highest percentage of nonwhite registered voters were slated to lose their main method of receiving a voter ID, despite the fact that voter ID laws already disproportionately affect voters of color. Sadly, it seems that litigation or the threat thereof is required for Alabama to make a move in the right direction. After Rep. Terri Sewell (D-AL) called for a Department of Justice investigation, the state announced that driver’s license examiners would “spend at least one day each month” issuing licenses in the counties slated for closure, which while better than complete inaction, is far from solving the problem. This move is an affront to democracy in a state that already has a terrible record on voting rights issues, as Alabama continues to represent the least healthy state democracy in the nation. Wisconsin was once considered a model of progressivism. Not only did the state’s progressive movement give rise to policies such as workers’ compensation laws, limited hours for workers, and conservation requirements, but it also gave the country leaders such as Edwin Witte, author of the 1935 Social Security Act. Recent attacks on Wisconsin’s democratic institutions read like a conservative wish list. In October, Wisconsin Gov. Scott Walker (R) signed a bill limiting the use of so-called John Doe investigations—secret investigations in which a judge decides if misconduct has occurred and witnesses are prevented from discussing ongoing proceedings, as an important tool in uncovering political corruption. This was perhaps unsurprising given that six people affiliated with Gov. Walker, either as aides or supporters, were convicted following a John Doe investigation. That’s not the only dangerous piece of legislation to emerge from Wisconsin this year—two others do incredible damage to the state’s democratic infrastructure and its safeguards against political corruption. The first guts Wisconsin’s gold-standard Government Accountability Board, which is currently made up of nonpartisan judges and has been lauded by legal experts who note that no other state “has a chief election administration authority with the same degree of insulation from partisan politics.” Now, the board will be replaced with two separate bodies: one to run elections and one to handle ethics issues, but both would be made up of political appointees rather than nonpartisan judges. The second bill will double Wisconsin’s current campaign contribution limits while permitting coordination between candidate committees and outside groups that are not required to disclose their donors. Gov. Walker quietly signed both of these bills into law on December 16 in a private ceremony, which was only revealed later via a tweet from the author of one of those bills. To cap it all off, Wisconsin has also significantly limited the ability of voters to make their voices heard in addressing these scandalous attacks on democracy. In October, a judge denied the American Civil Liberties Union’s request to expand the state’s strict voter ID laws to include veterans’ identification, out-of-state licenses, and identification from technical colleges. Overall, Wisconsin is in the midst of perhaps the nation’s most precipitous descent into electoral, ethical, and campaign finance chaos. With democracy issues continuing to play a major role in the national debate, states are wise to take advantage of this moment to move forward with common-sense, bipartisan reforms to make voting more accessible, influence in politics more transparent and accountable, and state government more representative of all citizens. While policymakers in Maryland, Kansas, Pennsylvania, Alabama, and Wisconsin have bucked this trend of reform, voters and state advocates will continue to hold them accountable for doing the work to build a healthier state democracy for all of their citizens. Lauren Harmon is the Voting Campaign Manager at the Center for American Progress Action Fund.